Can a north-sider be mayor? In the racket over Rahm Emanuel's residency, a key issue has been ignored. Emanuel claims he's been a Chicago resident for the last year, as required of mayoral candidates, because he owns a house on the north side, in Lakeview. Some of his opponents say he shouldn't be allowed to run because he rented out the house while he lived in Washington, where he was serving as President Obama's chief of staff. But Emanuel's problem is not that he hasn't really been living on the north side. His problem is that he hasn't been living on the south side. Chicago mayoral candidates aren't legally obliged to have a south-side address—it's just highly recommended. 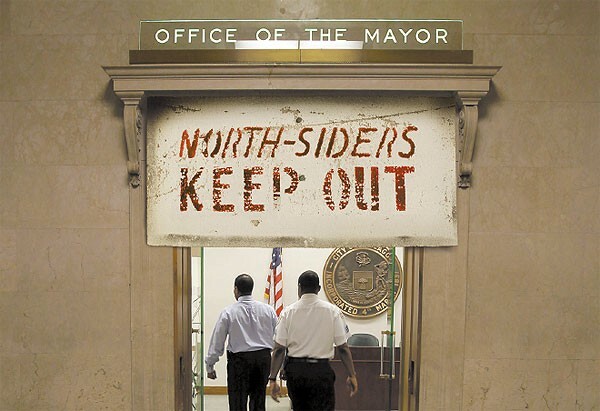 South-siders have been mayor for 51 of the last 55 years. And the lone exception—Jane Byrne, who served from 1979 to 1983—was only nominally a north-sider when she was mayor. She'd grown up in the northwest-side Sauganash neighborhood, but at the time of her election she was living in a high-rise condo at 111 E. Chestnut (860 North), near the Magnificent Mile. Unusual circumstances led to Byrne's victory in the 1979 Democratic primary. Right before the election a blizzard struck Chicago—this was back before global warming—and no one could get to the polls except for Magnificent Mile residents, who were wealthy enough to own snowshoes. The citywide turnout—12—was a record low, and consisted of Byrne and several relatives and friends, who boosted her to the nomination in a 7-5 landslide. In the general election she routed Republican Wallace Johnson of North Lake Shore Drive. In that pivotal snow-driven primary, Byrne also had the benefit of running against an incumbent with his own residency issues: Michael Bilandic. A Bridgeport alderman, Bilandic had been chosen by the City Council to take over for his neighbor Richard J. Daley in 1976, when Daley died in office, and won a special election in 1977 to finish the last two years of Daley's term. The transition was effortless—the mayor's residence moved four blocks, from 35th and Lowe to 32nd and Union. But soon south-siders smelled something foul about Bilandic. They suspected him not of forgivable trespasses, like steering top jobs to relatives and contracts to friends, but of a mortal sin—being a closet north-sider. After he became mayor he'd married a north-shore socialite, Heather Morgan, and the couple repeatedly flew to New York on weekends to shop and see theater. Bilandic swore his allegiance to Bridgeport, but south-siders' noses proved accurate: a year after he was snowed out of office, Bilandic defected to the Gold Coast with Heather. By 1983 the snow had stopped and the Magnificent Mile mayor was ousted by Harold Washington, in a historic election that proved Chicago's willingness to elect a person of the wrong color who lived on the right side of town: Washington was a Hyde Parker. The Mayors Daley account for most of the south-north imbalance the last 55 years, having occupied the office for 42 of them. Richard M. lived in Bridgeport until he moved to the south Loop in 1993. In between the Daleys, and besides Bilandic, the interloper Byrne, and Washington, there was also Eugene Sawyer (1987-1989), who completed Washington's second term after Washington died in office. Sawyer lived in the south side Greater Grand Crossing neighborhood. The last north-side mayor before Byrne, Martin Kennelly (1947-1955), was born in Bridgeport, but while mayor he lived in Edgewater's ritzy eastern end, at 5555 N. Sheridan. Preceding Kennelly were two more south-siders—Edward Kelly (1933-1947), yet another Bridgeporter, who lived in Kenwood while in office, and Anton Cermak (1931-1933), who lived in South Lawndale. So for nearly 80 years now, the only mayors who've lived north of Madison have been Magnificent Mile Byrne and North Shore Kennelly. With one asterisk. When Harold Washington died of a heart attack in 1987, vice mayor David Orr, alderman from Rogers Park, assumed the office. He was supposed to act as mayor only until aldermen decided which south-sider would next don the mantle. Orr quickly grew enchanted with the gig, however, and schemed to extend it, hanging out in bars on 63rd Street and claiming he was really from Marquette Park. But he blew his cover by ordering a daiquiri and was ousted from the mayor's post after only eight days. In the ensuing scandal he was demoted from alderman to Cook County clerk. The south-side dominance these last seven decades can be traced to the greater might of the Democratic machine in that half of town, site of its birth. The machine was fired up by Cermak and Kelly in the 1930s. Its fuel, patronage, always was more plentiful on the south side. North-siders were wealthier and better educated, and thus less dependent on city jobs. Many thought working in sewers was beneath them. South-side ward organizations were so superior at churning out votes that they sometimes shipped precinct workers to the north side to help their weaker brethren. But lawsuits against patronage, especially the one resulting in the Shakman decrees, have gradually eroded the inalienable right to trade jobs for doorbell ringers. Now a different currency—money, and the ads and campaign workers it can buy—rules Chicago mayoral contests. And when it comes to that kind of muscle, Emanuel is ripped. If he wins, the north side will have both the mayor and the governor, because Pat Quinn lives north of Madison, in Galewood. But south-siders shouldn't despair. After all, the most powerful politician in the nation is a south-sider. And not only Mike Madigan, but also the President.